The exciting new portal between 7th/Metro Center and The Bloc officially opened this morning. To use, exit 7th/Metro on the Hope Street side of the station. Click above for more about the portal. Photo by Steve Hymon/Metro. Reminder #1: the parking lot at the Expo Line’s Culver City Station closes Feb. 14. More here. Reminder #2: bus service replaces Expo Line service between Culver City Station and Expo/Bundy from 9 p.m. Friday through close of service Sunday night. More here. Reminder #3: a new round of community meetings is underway for the project that will extend the Eastside Gold Line to South El Monte and Whittier, among other cities. More here. Ridership is low on two of the fixed bus lines that serve Arcadia and city officials must weigh whether funding those lines is worth the expense — or whether it might be better to spend the money on dial-a-ride services, which are popular with residents who depend on transit. It’s worth noting that Metro spends hundreds of millions of dollars supporting local muni operators in L.A. County. Some enjoy solid ridership. Some don’t. It’s also worth noting that Arcadia is a classic So Cal suburb and despite its early days as a streetcar town, the city has spent much of the last century growing alongside the automobile. Car ownership, gasoline consumption and the number of miles driven in the United States are at all-time highs, but a new report from the Rocky Mountain Institute says we could be at ‘peak car’ and it may not be long before we’re dumping our cars in favor of autonomous, electric-powered ride-sharing vehicles. Look, folks. It is likely there will be more electric cars and hybrids. It’s probable there will be at least some self-driving cars employed by the likes of Uber and Lyft, etc. And maybe it’s even possible those self-driving electric cars will be as cheap as the current Ubers and Lyfts driven by humans and powered mostly by gasoline. But what evidence is there that car ownership is going to drop significantly in the short or even mid-term? None, really. America’s a big and spread out place and — get this — a lot of people like owning cars because of the convenience and mobility they afford. I think if priced right, it’s possible to switch a lot more Americans to cleaner cars (and that has been happening), but this idea that everyone ] wants to get rid of their car…well, I’m not sure that’s the way the rest of America sees it. I think a lot of America ❤️❤️❤️ their cars. BTW, there are more than 34.3 million registered vehicles in California. Even if car ownership dropped by 10 percent there would still be a ton of cars in the state. Credit: Santa Monica Mountains National Recreation Area. 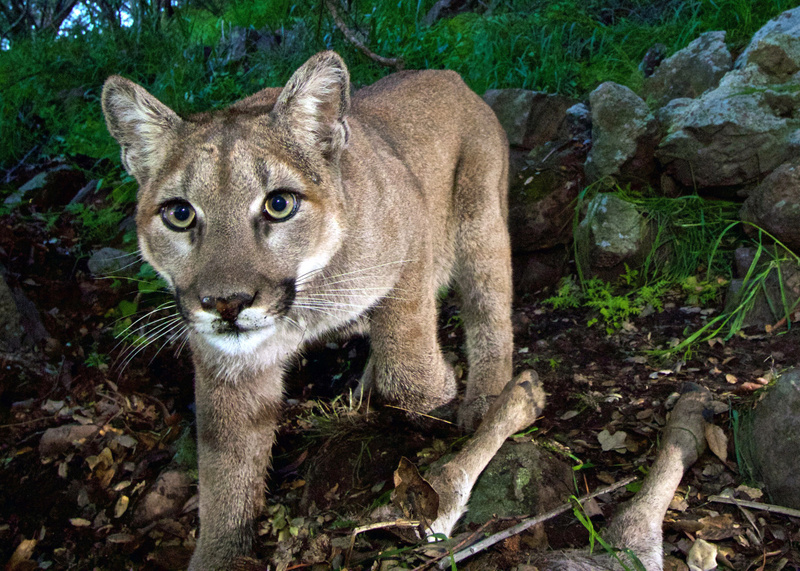 Nothing you haven’t read before but a great overview of the situation facing mountain lions in the Santa Monica Mountains. The gist: a small but stubborn population is holding on in our local mountains but are threatened by inbreeding. 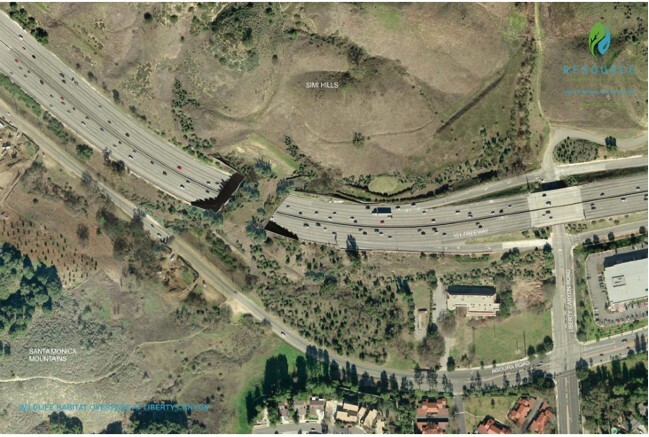 The bridge is estimated to cost $33 million to $38 million, although the New Yorker puts the tab higher — at $50 million. 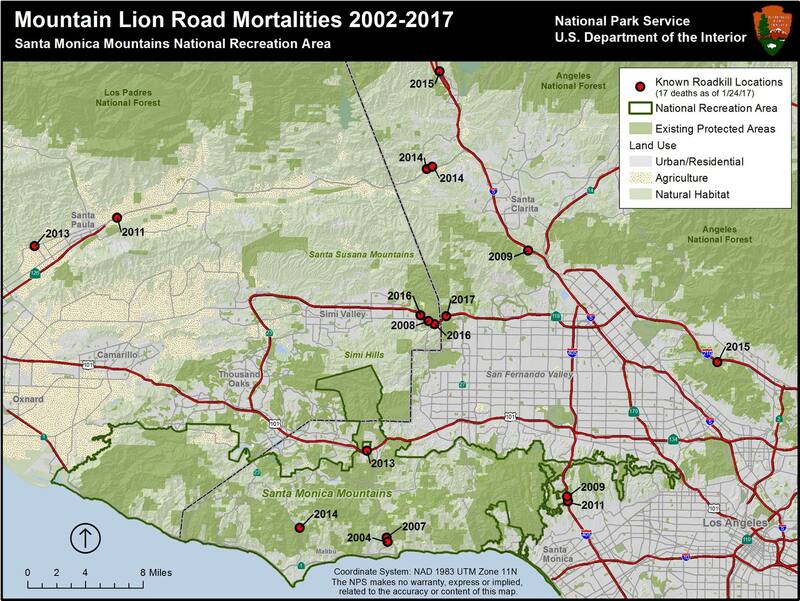 And finally this sobering reminder: lions have been shy about crossing the 101, the reason the Liberty Canyon crossing is important. But the 101 is hardly the only trouble spot. 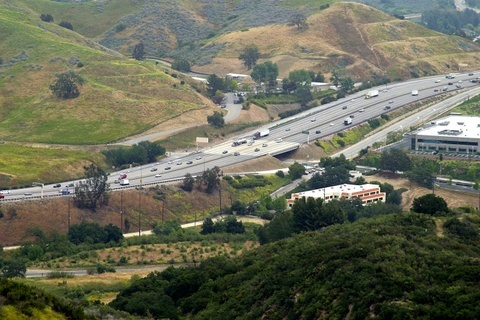 To the north, the 118 stands between the Simi Hills and the larger chunk of habitat to the north in the Los Padres National Forest. Beautiful Breezewood, Pennsylvania. Photo: Wikimedia Commons. What a great article. The gist of it: a key junction between Interstate 70 and the Pennsylvania Turnpike was never built due to a law no longer on the books. Instead, I-70 spaghettis through the town of Breezewood, where motorists can reach the turnpike. That’s great for businesses along the main roads in Breezewood. It’s bad for pretty much everyone else stuck in the traffic caused by the weird junction. Yet local officials in Pennsylvania have done a great job ensuring a direct connection between the freeways doesn’t get built — and isn’t even in the state’s infrastructure wish lists. What’s this have to do with President Trump? Nothing directly. As with all presidents, the article makes the point that local control — for worse and better — can get in the way of federal plans to invest in infrastructure. One example off the top of my head: in 2010, New Jersey officials refused to submit their fare share of the money for a much-needed new Amtrak and commuter rail tunnel under the Hudson River. The feds were prepared to spend billions on it. Since wishful thinking is one theme of today’s HWR, let’s close with a little music along those lines. Used the tunnel yesterday and today. Big improvement in the flow on getting to the BLOC and other destinations. Being as I’m always temporarily satisfied, I wish Wilshire/Vermont and Wilshire Western would consider also adding additional portals and exits. Wilshire Vermont especially. The crossing is a nightmare at times and there was an excellent opportunity when the towers were built to include it possibly. 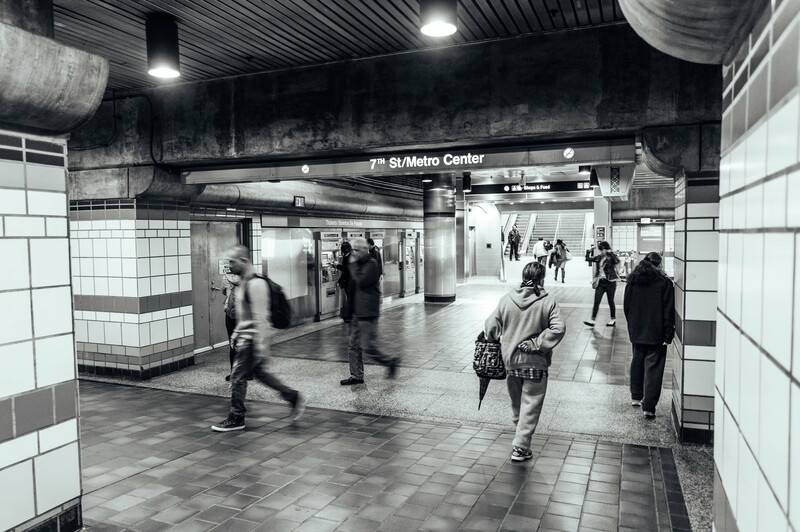 I know cost is a factor always, but the benefits of the Noho Tunnel and the Bloc Tunnel are pretty good for everyone. IS there any info on what stations have the potential? Something tells after looking that there are probably knock out pannels on the South east section of the upper platform at Wilshire and Vermont. Im assuming it left open the option to exit to Wilshire toward south western, or maybe even the bus property to the east? All and all bravo, and I hope to see more of these little big fixes. Another station that could use a second portal is Hollywood/Highland, so that the station could operate even during events near the current headhouse. Perhaps TheSource could do a piece on what potential there is for this at H/H and other stations. It would highlight the good work that the planning department at Metro and its construction partners have done. Yes, True! Youll notice a mezzanine on the south end as well, but no access to the lower platform. Im assuming whomever decides to use to property above could and should include it. Tbh, you should be able to exit that station from at least three different points. Ive wondered in the past why some of the emrgency exits aren’t just regular exits as well. I assumed maybe ADA regulations or the fact theyre so narrow, There would still be accesibilty, but only from the original points. Our actual portals are huge in comparison to some cities. Could it be fire regulations or earthquake; maybe both? Very curious.